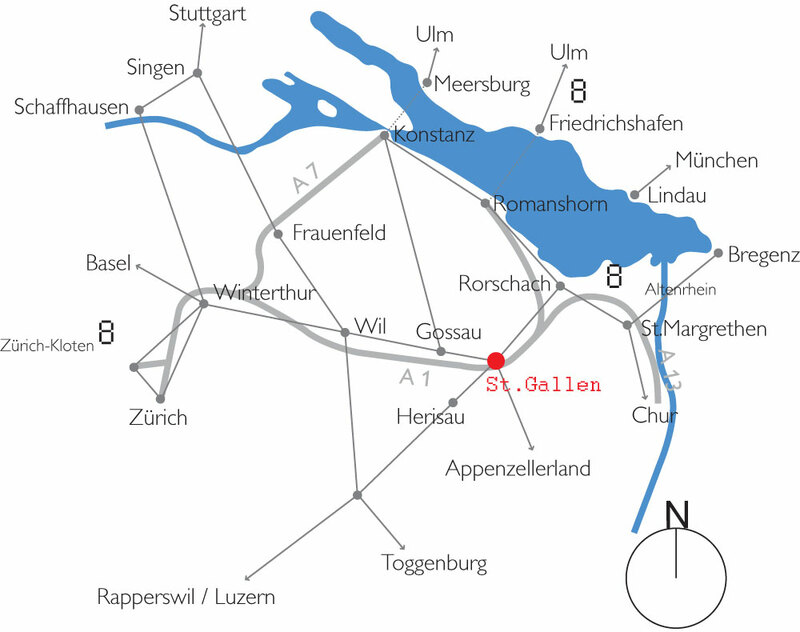 The University of St.Gallen can be reached by train (SBB), plane (Zurich Airport and St.Gallen Altenrhein Airport) as well as via the A1 motorway. St.Gallen is only one hour away from Zurich by car and is also easy to reach by public transport. Austria and Germany are also nearby. Distances: Zurich 1 hour, Munich 2.5 hours, Stuttgart 2.5 hours, Milan 3.5 hours. Trains run from Zurich’s main train station and Zurich airport to St.Gallen every 20 minutes. The journey takes about 1 hour. There are also direct express trains from Berne (2 hours), Geneva (4 hours) and Munich (3 hours) to St.Gallen. At St.Gallen’s main train station, take bus no. 5 towards Rotmonten. The buses run every 10 minutes. Get off at the "Universität/Dufourstrasse" bus stop and cross the main road. Or take bus no. 9 to "Universität/Gatterstrasse". Zurich airport is only one hour away from St.Gallen by car or train. A direct train runs from Zurich airport to St.Gallen twice an hour. The St.Gallen-Altenrhein airport is virtually at our doorstep, 10 minutes away from Rorschach and 30 minutes from St.Gallen.